Professional Makeup Artist, J Renée, did a recent Q&A with Abby here at Bold Blind Beauty. on magnetic eyelashes. Today, she is addressing a more serious issue about misconceptions on Albinism and appearance. When I saw the video included in today’s post I was happy and angry at the same time, let me explain. I was happy because I love it when people look out for one another. In this video, J Renée speaks to inappropriate comments another young woman received on YouTube. The young woman who has Albinism was on the receiving end of tasteless comments because people ‘felt’ she didn’t ‘look’ the part. This is where I got angry as not only did assumptions surface but going a step further some took it upon themselves to ‘correct’ her. Why does there have to be an all or nothing approach when it comes to people or the conditions we live with? Why can’t we accept that we are as varied and at the same time as complex as our individual genetic makeup? When people share are open enough to share their story the least we can do is be open enough to receive it without challenging their identity. Blind Beauty is a mock fashion magazine cover. Jennifer Renée is wearing a purple shirt and posing in front of a white background with her hand by her chin. She is wearing purple and pink eyeshadows and magenta lip gloss. Her natural golden blonde hair is pulled back in a ponytail. Image #1 In this photo, J Renée’s long blond hair is flowing freely while framing her face. The background is pretty jewel-toned turquoise and she is wearing pink/fuchsia tee and jacket. Her lip color is fuchsia and she’s wearing turquoise colored eyeshadow. Image #2 J Renée looks fabulous with her hair in braids and she is wearing a muted lip color and a purple blouse. As a blind woman who loves to wear makeup, there are few things more challenging than applying false eyelashes. When I heard about magnetic eyelashes I wondered how they compared with other types of false lashes. 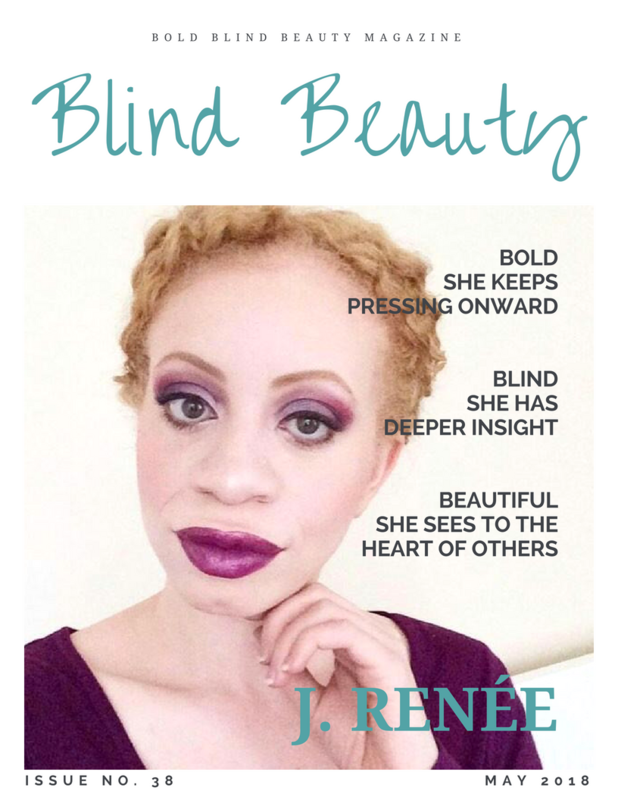 Recently I caught up with J. Renée, 1st #AlbinoBeauty Influencer, to ask her a few burning questions on magnetic eyelashes. Abby: In comparison with the glue-on lashes are the magnetic ones easier to handle? J. Renée: Yes, initially I thought so. There are some pros and cons. Abby: What are a few difficulties you had in trying them for the first time? J. Renée: Well, I’ve never really attempted to apply any lashes on myself before so it was all new to me. I have applied them on models which I think isn’t as difficult. The magnets were difficult to align on my own eyes at first. 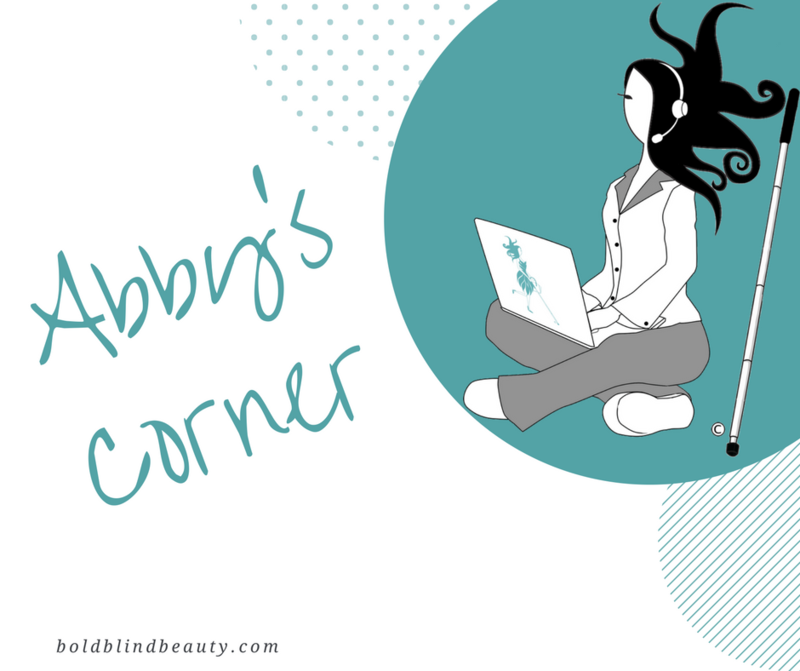 Abby: About how long did it take you to become comfortable applying the magnetic lashes? J. Renée: I tried them once and took about 20 minutes. I think with practice, I could get them on easily. Abby: Can you feel them once they are in place? Are they weighty? J. Renée: I could not feel them. They feel pretty lightweight. Abby: What is the cost comparison? J. Renée: These cost about twice as much as a regular pair of glue lashes. Abby: You mentioned press-on lashes will be coming out soon? Do you know when or where they will be available? J. Renée: I heard that they were new but when I looked into it more, they’ve been available for a few years. I had never tried them before so I’m going to find them to try. Abby: J. Renée thank for sharing your thoughts with us on magnetic eyelashes. You’ll have to follow-up with us on the press-on ones. Abby is on the job sitting cross-legged in her PJs (gray bottoms & white top with a gray collar). She is holding her laptop (complete with a teal Abby logo) on her lap. Sporting her signature explosive hairstyle, she is wearing a headset/microphone. The white cane is propped up next to her. A close-up image of J. Renée’s pretty eyes framed by long, lush, dark lashes, and she is wearing a pink lip color.